U-channel shipper slides over the straight edges of glass panels, insulated glass, furniture, and other flat surfaces to prevent chipping and cracking. PROTEK™ U-channel packaging is ready to use right out of the package. Just cut off a piece and slide it over the edge(s) that need protecting. 200 ft. coils are packaged in polybags and shipped for your convenience. Simply remove from the bag and start PROTEK-ting your products! 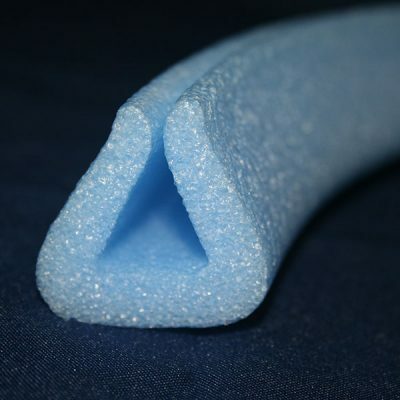 2.0# dense, blue extruded polyethylene foam is a non-abrasive, resilient solution with high compression strength so it won’t crush, crumble, or lose its shape. All weather PROTEK™ foam won’t even fall apart if it gets wet! Flexible foam expands to accommodate straight lines up to 0.875″ thick for outstanding edge protection.